The great German film Downfall starts with Hitler being very gentle to his nervous, young secretary. Darkest Hour begins with Churchill being beastly to his. Comparisons between the two men end there; this is ‘Upfall’, about a vulnerable man desperately trying to save his country whilst battling old age, loneliness and depression. Most of us know the Churchill legend well. It’s 1940 and Britain is in deadly peril from Europe while its government flounders. The policy of appeasement led by Chamberlain has failed, so he must go. Unfortunately Churchill, who wants to fight the Germans, has been an outsider since he twice crossed the floor of the House from Liberal to Tory. He is also discredited by the disastrous failure of his Gallipoli campaign in 1915. No one wants him at the helm. As France totters before the Nazi onslaught, Chamberlain, given rare sympathy in this film by veteran actor Ronald Pickup, and Halifax, played with chilly wrong-headedness by Stephen Dillane, try to come up with ways to continue appeasement and block Churchill’s way to power. Part of the success of the film is that it stays within this time-frame, tight as a theatre play. Focused on isolated, unhappy Churchill, it takes us with him into the dark, claustrophobic corridors of power. Through a few old newsreels we know the enemy is getting nearer, but we also see Churchill rushing about in his bowker hat, spotted bow-tie and cigar, looking like a bewildered little man in a David Low cartoon. 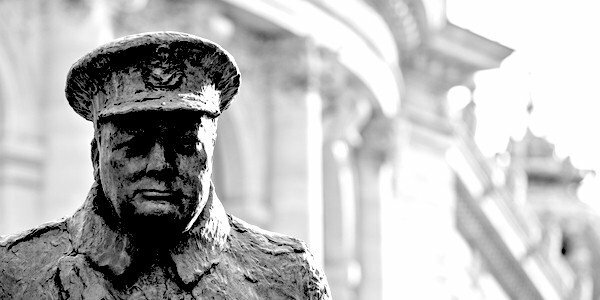 The comic aspect of Churchill’s appearance and character makes his plight ever more real. Central to this is the delightful performance, there is no other word for it, by Gary Oldman. He encapsulates, only mildly touched on by Brian Cox in a TV version, and not at all by the pompous Robert Hardy, the intrinsic humour of the great man. Apart from his natural verbal wit, Churchill was highly eccentric in a very British way; taking important meetings in bed with cats on the coverlet, dictating speeches from the bath, and staggering through his days fuelled by Pol Roger champagne and whisky. Even Hitler commented on his drunkenness: no doubt the jokes passed him by. Although the film pays pleasing attention to detail, they get it wrong about the cats: the ginger tom resided at Chartwell. At Downing Street Churchill had a black cat called Munich. The film is allowed to verge on black comedy, that most difficult and most British of art forms. The characters, apart from Churchill’s pretty and distressed young secretary, played by Lily James, use irony and jokes as their defence mechanism. They talk in riddles and it is good to hear, as that style of talk will probably be extinct within the next generation as we increasingly adopt American literalness. Gifted and wicked-tongued, the aristocrats and toffs surrounding Churchill score off each other as if they were in a senior common room. Even Churchill’s wife, the long-suffering Clementine, played with skilled insouciance by Kristin Scott Thomas, has some good lines. She is seen as unfulfilled, pulling away from the needs of her husband’s towering ego, but of course they always pull together when necessary, with much prickly banter. The film abounds with personal tensions. The King, played by Ben Mendelsohn much more convincingly than Colin Firth, is still dismayed that Churchill backed his older brother over the Abdication. There is a telling moment in the Palace, surrounded by grand porcelain ornaments, royal photos, and Stubbs’s Whistlejacket looking down, when Churchill has to kiss his sovereign’s hand. We see the nervous, stammering king wipe it furtively behind his back. It’s accidentally, anachronistically amusing after the King has changed his mind and decided to back Churchill to hear him say he’s sorry ‘about how cruelly you’ve been tweeted’. This newest version of the great fable of Britain standing alone in 1940 has divided critics along ideological lines; the New Statesman said it was made for Brexiteers who can only look backwards to our inglorious past. Charles Moore in the Spectator refused to see it after hearing that it includes a scene where Churchill takes the Tube and some good advice from a black passenger. In our own uncertain times it can’t just be chance that this is the second film in a few months showing our miraculous escape from potential catastrophe in a conflict with Europe. Christopher Nolan’s Dunkirk was a big hit, and Joe Wright, director of Darkest Hour, gave us nightmarish scenes from the Dunkirk evacuation in his earlier work, Atonement. We also know all about a weak, floundering government presiding over a bitterly divided nation. But the commentators who have labelled the film a Brexit parable are really complicating matters. Unlike Downfall or Atonement, this film is very good, mid-market entertainment, telling a ripping yarn. It’s fun, moving, sentimental and there is no real political sub-text. Of course these days it is a problem for any British or American film director to make a film which shows a lot of powerful white men. Darkest Hour gets around this by giving leading roles to Churchill’s secretary, who has lost her brother at Dunkirk, and to his wife. It takes a bigger gamble with reality when Churchill takes the Tube to Westminster. He did board the Underground during the General Strike and legend has it that he spent hours going round the Circle Line, unable get off. The version in the film is even more unlikely: he meets a carriageful of passengers from every walk of life, including a young black man who finishes off the line when he quotes from Homer. He consults them on what he should do about the current crisis and they tell him the country wants to fight on. Having got his answer he goes back above ground and does just that. Against that tear-jerking hokum, we have the cleverness of a scene where Churchill, approaching despair, goes into a lavatory-like closet to phone the American president, and begs for help whilst trying to keep as much dignity as he can. Again we are close by Churchill in that tiny space; identifying with him in the bitter experience of finding out that your glamorous best friend is not your friend at all. Charles Moore has really missed a wholesome treat. Among the only disappointments was Samuel West as Anthony Eden. He wasn’t given much to say and stared at Churchill as if he were a second Messiah. We also had to endure a profoundly soppy, manipulative musical soundtrack, something now apparently unavoidable. In this case it was almost blasphemous with its tinkling crescendo as Churchill’s voice reached the climax of his great speech offering the British people nothing but blood, sweat, toil and tears – words which no more need a piano accompaniment than Henry V’s speech before Agincourt.